Good writers are voracious readers. They tell compelling stories, develop distinct voices, and anticipate their audience members’ questions. Ultimately, good writers see writing as a process of sifting through and even wrestling with competing ideas, formulating and organizing their own thoughts, and sharing them with others in a way that is clear, persuasive and respectful. They leave a lasting impression. 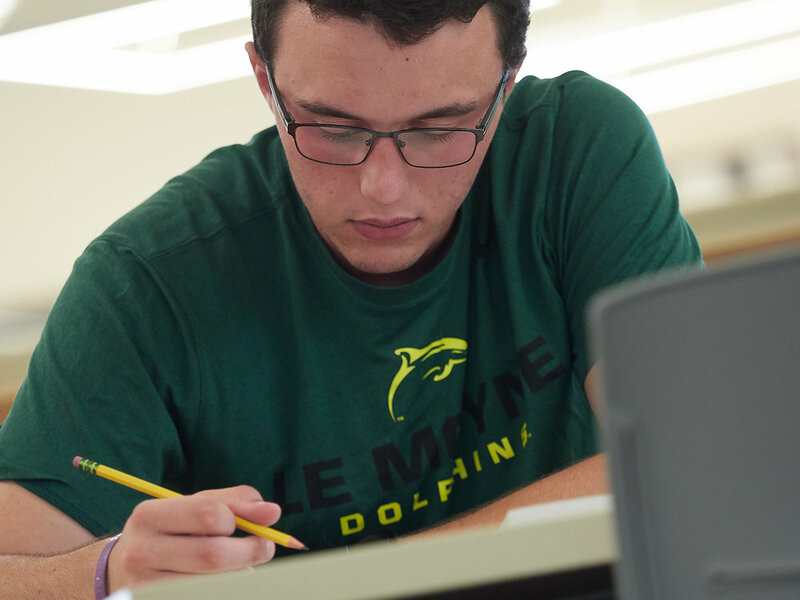 At Le Moyne College, our goal is to nurture writers who can do just that. Throughout the College’s First Year Writing Program, we prepare our students to read, think and write critically, skills that will serve as the foundation for the rest of their education – and their lives. Students learn in small classes that in effect become mini-writing communities, working under the guidance of faculty members who provide them with personal attention and individual feedback. 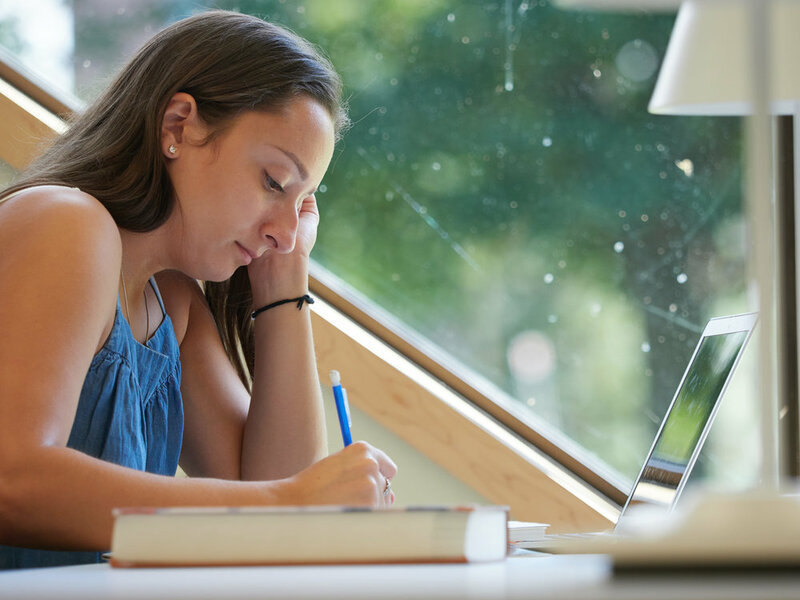 “We teach our students that writing is a process and a lens through which thinking happens,” says Miles Taylor, Ph.D., director of writing and associate professor of English. Writing has been a central component of Jesuit education for more than 450 years. It’s not surprising then that the craft is a key component of Le Moyne’s strategic plan, Sempre Avanti (Always Forward). The plan upholds the depth and permanence of the College’s Ignatian roots while also recognizing the forward momentum of change and the invigorating call of, and response to, history and innovation. It acknowledges that tomorrow’s leaders will face challenges, including an explosion of data, the rise of mobility, and the emergence of multiple new platforms to communicate and share information. In order to navigate this complicated landscape, they will need a solid academic foundation that prepares them for a lifetime of learning. To that end, last year, the College publicly embarked upon a $100 million comprehensive campaign that will enable Le Moyne to make strategic investments in programming and opportunities that will strengthen students’ learning outcomes, enable faculty to be both scholars and mentors, and prepare students for careers that will bring them meaning and success. Investing in writing instruction is a key component of the campaign. College leaders plan to launch a writing center that will host visiting experts in instructional design, pedagogy and creative writing along with workshops for faculty members in all disciplines to advance writing across campus. Hannan notes that reading, thinking and writing are foundational to successful engagement with “social, political, cultural and professional life,” as well as “personal fulfillment.” But it goes beyond that. Writing persuasively requires individuals to engage with others in a manner that is respectful and constructive: this aligns perfectly with the College’s mission to prepare its members for leadership and service to promote a more just society in their personal and professional lives. Ultimately, faculty members want students to discover that writing is one of the best ways to sort through any number of challenges. That is something that Nicole Weaver, Ph.D., assistant director of writing, reminds her students of daily. Whether in the form of résumés and cover letters or, in the digital age, emails, LinkedIn profiles and text messages, she stresses to her students that the first impression we make on others is often through our writing. Weaver sometimes asks her students what they might be in the future. A nurse? An accountant? A police officer? She then encourages them to consider the writing that those jobs require, including patient reports, client recommendations, and requests for search warrants. The more examples they find, the clearer it becomes that writing is crucial to success.